The GMC Syclone will, and has, gone down in history as one very iconic and special sport truck. There aren’t, and haven’t, been too many vehicles produced in the same fashion. Car and Driver has reached back into its archives, almost 25 years back, and graced us with a one-of-a-kind comparison test only the engineering of the 1990s could bring: the GMC Syclone vs. the Ferrari 348ts. C&D uses a proper metaphor of a the GMC being a punk in a muscle t-shirt. It looks tough, but does it have the credentials to back itself up? Why yes, yes it does. Because, as C/D says, under that muscle tee was a time-appropriate 280-horsepower (which was underrated) from a 4.3-liter V6. Ah, but let us not forget the V6 had been turbocharged to 14-psi and liquid-intercooled. That power was delivered to a full time, four-wheel drive system and matted to a four-speed automatic. There was even a torque converter to make the best of the Syclone’s boost range, minimizing turbo lag. And we wish those chunky polished alloy wheels would come back into style. So the Syclone had the specs some sports cars of that period would have died for, and even had the exclusivity factor to match, with only 3,000 units produced. So, how’d it do? Let’s just say the Ferrari gets a pretty good look at the tailgate of the Syclone before the 348ts enters its element and closes the gap. As the finishing marker approaches, well, you should check out C/D’s full write up for the final result. 25 years later, if you are a lucky owner of a Syclone, make sure you print a copy of this Car and Driver comparison test out. That way, you can tell your non-car buddies that your pickup truck isn’t just a “pickup truck.” In fact, in can take on some of Maranello’s finest. 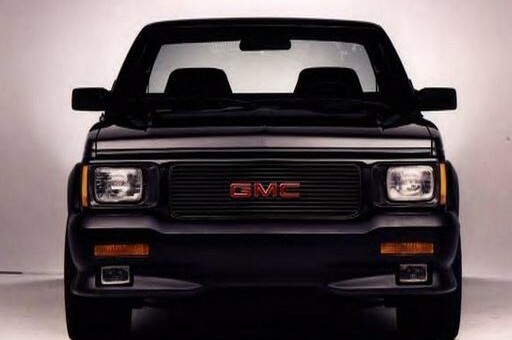 Yes, the GMC Syclone – and its cousin, the Chevrolet Jimmy – were real beasts! I think you mean GMC Typhoon. It is crazy to look at this today and remember how powerful these were and today my 2.0 4 has 10 more HP and 10 more PSI of boost. The one thing they have not improved on is the traction as the AWD is the real key to these vehicles. Note too the 348 numbers are nothing all that impressive today either. While we thought things were good back then after the 70’s today really is the golden era. Syclone (and Typhoon) made more power than they were rated for. They were a little over 300 and over 400 for torque. Backed up by mid 13 second time slips around 13.4-13.6 if they’re still in good working order. Typhoon’s weighed a bit more so were slower, but that Syclone will run right with a brand sprankin new 470hp SRT8 Jeep. Come on, GMC! Do it again! Build a new Syclone with more torque and HP using the modern V6 engine. A successor with the CTS VSport’s twin-turbo V6 would certainly be something wouldn’t it? I’m sure GMC could shove that motor into the Canyon somehow. While a new Syclone would be neat just how much would the average buyer pay? To do a modern TT v6 it would be very expensive if you did it with the proper AWD. Just how many would you have to make and how much would they have to be in making them profitable? This is the kind of question that needs to be asked. Now on the other hand a 300+ HP Eco Turbo with just RWD in a standard cab at a sub $35K with a ZQ8 suspension. Now that would be cheap to build and you would sell it in greater numbers. The flat and torque band would be very good here. While I would like to see an all out version with AWD and Twin Turbo the price would make it a difficult truck for many to own and I would like t see people get these trucks at a price where they an do their own things to them. With the likelihood of a Sub Alpha RWD Turbo coupe becoming less and less likely this would be a good way to offer a great handling performance vehicle with RWD and the Turbo motor for cheap. Offer this truck with the base body all the way up to a loaded model if they want it. just make the suspension and engine a joint package to the standard cab with a standard limited slip and it would make a good affordable package for fun. It would be the fun RWD below the Camaro and it could still be practical as it can haul two different ways.